In Fantastic Beasts and Where to Find Them, we are introduced to Newt Scamander, played by Eddie Redmayne, a wizard and magizoologist on a mission to find magical beasts and capture them. During his adventures, he meets with Magical Congress of the United States of America (MACUSA), the organization that oversees the wizards in the States. In the end, it’s revealed that Grave (Colin Farrell), the head of MACUSA’s Department of Magical Law Enforcement, was actually Grindelwald, a dark wizard who has a history with Albus Dumbledore, considered the greatest wizard alive. 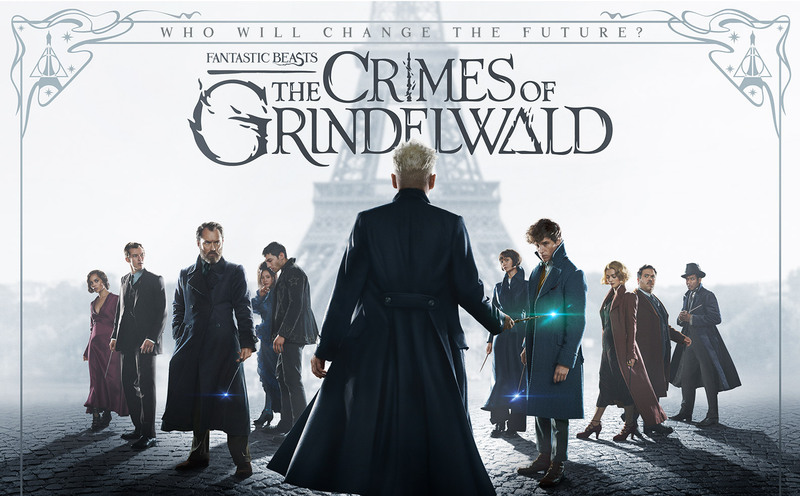 In Fantastic Beasts: The Crimes of Grindelwald, Grindelwald breaks free and it’s up to Newt and his friends to find out what he is up to and try to put a stop to it. In Fantastic Beasts: The Crimes of Grindelwald, Newt’s adventures of taming beasts take a back seat to focus on Grindelwald and his plan to make wizards reign supreme over the non-magical people, aka No-Majs/Muggles. Don’t worry, there is a scene involving Newt performing his wacky techniques to capture a beast, so all isn’t lost. Newt’s friends are back including Tina Goldstein (Katherine Waterston), Jacob Kowalski (Dan Fogler), and Queenie Goldstein (Alison Sudol). Tina’s role is limited here with Jacob and Queenie having a bit more to do as their relationship is held by a thread. The moments they have together are sweet, and it gets emotional when their relationship is put to the test. Queenie is tempted by Grindelwald’s vision of wizards being able to do whatever they want, and that includes having a relationship with a No-Maj. Fantastic Beasts: The Crimes of Grindelwald works best when Grindelwald gives wizards a compelling reason to join his crusade. However, that’s all thrown out the window since we still see him as a one-dimensional villain. After seeing Farrell play Grindelwald in disguise, I would have preferred if he returned as Grindelwald with a different look. He was able to add dimension as an antagonist. Maybe that will change in the future, and perhaps we’ll get to see Johnny Depp’s Grindelwald as a very complex villain. Jude Laws truly shines as Albus Dumbledore. He is charismatic and excels at bringing audiences a younger version of the wise and kind wizard. There’s a scene involving Law and Redmayne, and one can’t help but be enamored by any scene he’s involved in. Ezra Miller is back as Credence, the powerful wizard who is central to Grindelwald’s plan. With Credence, he meets Nagini (Claudia Kim), who’s revealed to be a Maledictus, which surprised many Harry Potter fans. The Maledictus is someone who is destined to be transformed into a beast forever thanks to a blood curse. Together Credence and Nagini form a bond, but that bond will be tested with Grindelwald tempting him to join his cause. With the way things are going, the movie is definitely hinting at more Nagini in future movies, and here’s hoping that she’ll have more layers to her. The weakest aspect of the film is the introduction of new supporting characters like Zoe Kravitz as Leta Lestrange and Callum Turner as Theseus Scamander, Newt’s brother. Theseus is completely different from Newt in personality and physique, and on paper, it sounds like a fun interaction. However, watching them together on the screen provides little amusement. Leta has a past with Newt in high school, but the film’s running time doesn’t allow that relationship to flesh out, leaving much to be desired. Fantastic Beasts: The Crimes of Grindelwald has a lot for fans to be excited and emotional about. Redmayne is wonderful as the quirky and innocent wizard, and Law’s portrayal of Dumbledore is a delight. Seeing wizards struggling with their way of life was an emotional ride. It’s definitely recommended for fans of the Harry Potter world, but it could have been better with more care for the supporting characters and the one-dimensional Grindelwald. The post Fantastic Beasts: The Crimes of Grindelwald review appeared first on Nerd Reactor.